Flank steak is called so because it is the meat of the cow that is taken from its side, below the area of the ribs. Flank steak is a thin and fairly wide cut— at its thickest point. It is only 1 to 1-1/2 inches and is thinner toward one of its end. This implies that flank steak cooks quite quickly and the tapered, wide shape makes it a perfect choice when the cooking is done for a crowd – there is a large amount of meat to share and the same cut provides both the well-done slices as well as the rare slices, therefore keeping everyone happy. Read on to know how to cook flank steak. This is a magical recipe that answers how to cook flank steak perfectly, which takes about 2 hours and 5 minutes in total to make 4 servings. ● Put a small saucepan over medium high heat and pour the balsamic vinegar into it. Simmer it and cook it till it is reduced to 1 cup. Cool and set aside. ● Heat 2 tbsp. of oil in a heavy bottomed pan over medium high heat. Add the chopped onions and sauté until soft or for 3-4 minutes. Now add the garlic and sauté for 1 minute. ● Add water and ketchup and cook till the mixture boils. Now reduce the heat and let it simmer for 5-6 minutes. ● Now add the remaining ingredients and the reduced balsamic vinegar and cook until the mixture is thickened for around 10 minutes, stirring occasionally. ● Use an immersion blender to puree the mixture to form a smooth sauce and season with pepper and salt, to taste. Cool and pour in a bowl. Store the sauce in a tightly sealed container in the refrigerator, where it will keep for 1 week. ● Now heat the grill to high. Take the remaining 2 tbsp. of oil to lightly brush on the flank steak. Use liberal amounts of salt and pepper to season it. ● Place in the grill and grill each side for 4 minute each or until golden brown. Move the steak to a cooler area of the grill where there is no direct heat. ● Cover with the sauce and turn several times to cook from both sides and cook until it is medium-rare, for about 15 minutes. ● Remove to a cutting board and loosely cover with foil. Let it rest for 10 minutes, before slicing it into thin pieces. ● Brush both sides of the bread with olive oil. Use pepper and salt to season it and place on the grill and grill from both sides. ● Remove the bread and put grated Monterey Jack cheese onto it. Place the slices on an aluminum foil and again grill until the cheese melts. Transfer to a serving plate. The last step – put the slices of flank steak on the grilled bread. Garnish with scallions and serve. ● Take a large baking dish and whisk together wine, shallots and olive oil. Place the steak and coat from both sides. Cover and put in a refrigerator overnight or for 4 hours. ● Heat the grill to high. ● Blot the steak with paper towels. Place it on a flat surface. Now, season it with pepper and salt. Place prosciutto slice on the cut surface, on top of it place a layer of cheese and then a layer of basil leaves. ● Now roll the steak tightly around the filling. Tie the steak roll using kitchen string in 5-6 places. ● Brush the steak with oil. Season it with pepper and salt again. Place in the grill and grill for 8-10 minutes or until brown from all the sides, turning it at least 4 times in between. ● Move the steak to a cooler area of the grill where there is no direct heat and cook for another 15-20 minutes or until medium-rare. ● Remove and let it rest for 5 minutes. Slice against the grain to form ½ inch thick slices and pour Cabernet-Shallot Reduction. Want more answer to how to cook flank steak? Here it comes, which takes about 40 minutes in total to make 5 servings. 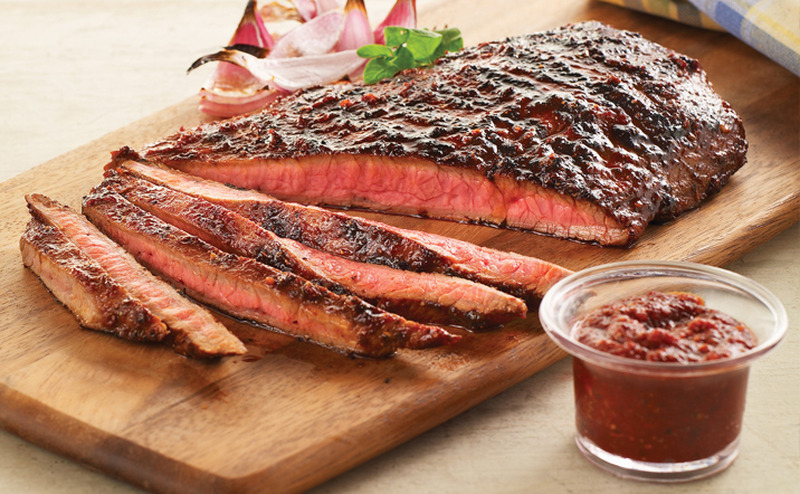 ● Take flank steak and marinate in salt, lime juice and pepper. Preheat the oven broiler. Put the marinated steak on the broiler pan and cook on both the sides until medium rare, for 4 minutes on each side. Remove and place on a cutting board and let it rest. ● Preheat the oven to 475°F. Pour olive oil, pepper and salt over cauliflower and broccoli and place over a cookie sheet in one layer. Roast in the oven and turn once in between, for about 10-13 minutes or until cooked through and tender. ● Cut the cooked flank steak into thin slices. Serve 3-4 ounces of flank steak per person along with a side of roasted veggies.